RRB Bangalore recruitment 2019| Latest JE 792 vacancy notification link! 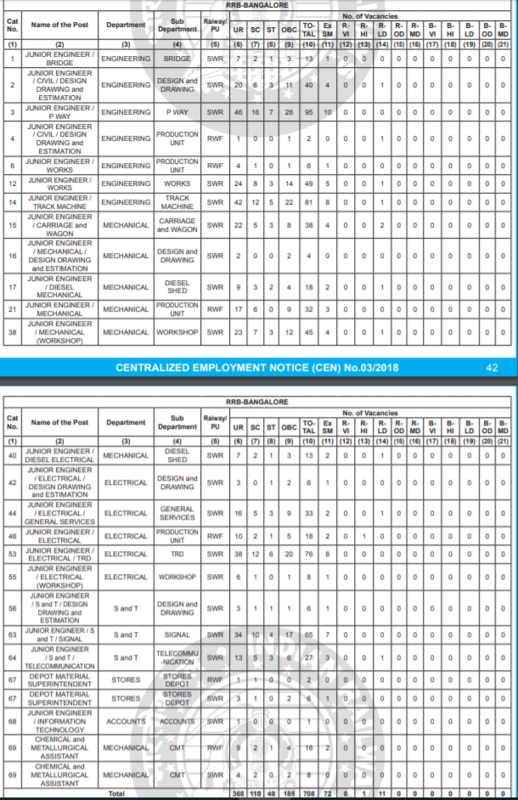 RRB Bangalore recruitment 2019-2020: Applicants from Indian nationals (male and female) are invited from the desirous and eligible applicants to fill-up the following 792 vacancies to the posts (JE), DMS & CMA jobs in the railway recruitment board Bangalore zone. All the interested candidates must check out the important dates, eligibility criteria such as Age limit, Requirement & desirable Education qualification, Exam Syllabus, Exam pattern, official notification and apply online link. You can apply for the railway jobs on their official website (http://www.indianrailways.gov.in or http://www.rrbbnc.gov.in/ ) as per given below schedule. It’s not about poor or financially problem, today world everyone needs jobs, so make your sister and brother enough capable to crack exam, usually every railway exam have same exam pattern please ask them to do preparation for that, and keep visiting our website and apply for the jobs. You can check the latest RRB vacancy by clicking here.